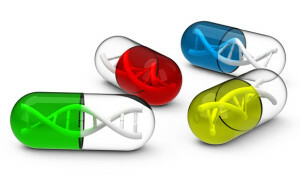 Genetic variants identifiable as pharmacogenomic markers are described by utilizing a special nomenclature, which is not elsewhere used in genetics. It is the so-called star allele nomenclature. In this nomenclature, alleles aren’t identified by their cDNA or genomic position (as it usually happens with all other genetic variants – see HGVS nomenclature), but through the means of numbers and letters, separated from the gene name by a star (star allele nomenclature). For example: CYP3A5*2 identifies the genetic variant in the CYP3A5 gene at the genomic position g.27289C>A, which leads to the amino acid substitution p.T398N. The star allele nomenclature is thought to be faster and easier for non-specialized professionals in identifying important pharmacogenetic alleles, helping them avoid transcription mistakes which may be more frequent by using the standard HGVS nomenclature. The star allele nomenclature has been firstly used to identify alleles within the cytochrome P450 (CYP) gene family. From that, it spread to all genes that have been studied in pharmacogenomics. The list of the star alleles of the cytochrome P450 gene family and of the POR gene is available at http://www.cypalleles.ki.se. Variations in the cytochrome P450 genes (CYP) lead to four different metabolizer phenotypes: ultrarapid, extensive, intermediate and poor. A patient with ultrarapid drug metabolism harbors double or multiple copies of an allele with normal or increased functionality, whereas patients with intermediate or poor drug metabolism have one or more alleles with reduced functionality (these alleles are typically consistent with inactivating mutations or large gene deletions). The term extensive metabolizer is used instead to describe those individuals with two standard copies of the normally functional allele. Extensive metabolizers are therefore carrying the wild-type allele, also called consensus allele, which corresponds to the allele *1 in the star allele nomenclature. The numbers *2, *3, *4 and so on represent alleles with altered functionality which may lead to profiles of increased or reduced drug metabolism. A) to distinguish an allele of proved pharmacogenomic relevance from a group of alleles where this allele is segregating together with other neutral alleles, numbers and letters are used. Example: the symbol CYP2B6*4A identifies the pharmacogenomic relevant allele K262R in the CYP2B6 gene, whereas the symbol CYP2B6*4B identifies the combination of the K262R allele with one or more of the polymorphisms which can be easily detected in association with it: -2320T>C; -1778A>G; -1186C>G; -750T>C; 18053A>G. In both cases (CYP2B6*4A and CYP2B6*4B) the pharmacogenomic effect remains the one of K262R. B) similarly, to identify group of functional alleles, the number of the most “powerful” allele is always used, followed by a letter. In all cases, the pharmacogenomic effect observed at the clinical level is always the one given by the splice mutation 681G>A. Of note, the first alleles described in the CYP genes family did not follow these rules exactly, nevertheless their original nomenclature is still used for simplicity. The star allele nomenclature has some defects. First of all it does not indicate the mutation type, i.e. if it is a missense, nonsense or splice mutation or if it’s a large deletion/duplication. Moreover, even if it can identify a group of alleles under one single code, it is not flexible enough to express the complexity and the enormous amount of data as produced by high-throughput sequencing (e.g exome sequencing and genome sequencing). Nevertheless the star allele nomenclature remains still today the gold-standard in the identification of pharmacogenomic markers not only in research but also in clinical guidelines and official documents. Posted in Academia, Last Update, Medical Genetics, Pharmacogenomics and tagged pharmacogenomics, star allele nomenclature.